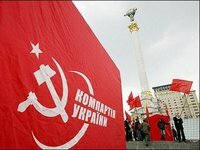 MP Oksana Kaletnyk has left the Communist Party's faction in the parliament, Verkhovna Rada Chairman Oleksandr Turchynov said. "Under the submission of the relative application, and according to Part 3 Article 60 of the Verkhovna Rada's procedure rules, I announce the withdrawal of MP Oksana Kaletnyk from the deputy faction of the Communist Party," Turchynov said at the plenary sitting of the parliament on Thursday. Kaletnyk left the faction at her own request.